I'd put Sue on the list. As that costume has been erased from my mind, it didn't last long all and it is universally hated as being something the character would never wear. * Don't come from a ghetto. Electrical Black people is a stereotype now? Maybe Mr. Terrific unles Batman type gadgets fall under mechanical based powers. I'm tentatively going to suggest Apollo and the Midnighter, depending on what wishy-washy means, which could rule out any character ever who has been in a relationship, straight or gay. Can't count Stephanie Brown, because she was kidnapped and tortured to "death" by Black Mask for an obvious fridging/life lesson for the male hero. You really did have to remind me, did you? Just when I finally had it blocked out. Lesbian hero: Karma not butch has never dated a team-mate. I personally disagree about MAC; she's not "butch" but she's hardly a "lipstick lesbian" either (which in of itself is a stereotype). She's fiery, and strong (her body would be athletic not model). Anole's costume is green and black, he's aggressive and headstrong... his recent date was a little "wishy-washy". Though to be clear I don't consider him a stereotype; which is why he's so popular. Benjamin Deeds' costume is yellow and black, he has no boyfriend and he's shy (not flamboyant). Korg. Muscle bound, yellow/black costume, very tight-lipped about his lover. the Mighty Destroyer. Costume red and blue/black, white mask; again tight-lipped about his lover, leader, stubborn, not flamboyant. Rictor. Costume dark/muddy greens and greys, not flamboyant; can be a tad "wishy-washy", but mostly just a strong relationship. Karma. She's not butch and she's never dated. I remember at school I had a black acquaintance who was excited about seeing Spawn because he liked Batman and the Crow's films and never thought there would be a similar black hero. the mechanical/armor thing...no one thinks of that as a ethnic/racial trait. The thing is, while in real life a mechanical aptitude isn't particularly associated with blacks, in superhero comics, for some reason, there are TONS of black characters that are cyborgs or have tech powers, and that before cyborgs became a cool thing in the 1990s. A disproportionate amount. I don't really know why. Perhaps because shining metal looks cooler or more contrasting against darker skin? Grace Choi has you covered on the butch lesbian front. But not the not dating a team member thing. That'd be tough to find on any team book, though. 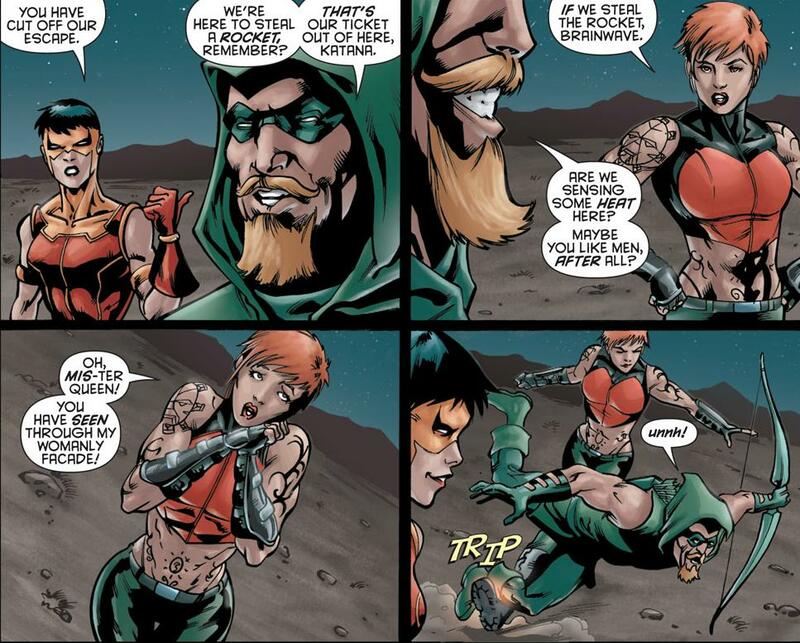 Relationships are usually within the team because nobody wants Terry Long hanging around. She slept with your old sidekick, Ollie, so she must like men well enough. Just not assholes like you. These feel less like stereotypes and more like ways of ruling out the characters you can think of. Probably. But I was thinking more about it, and perhaps it's some sort of weird convergence. Black superheroes started to appear in the 1960s and 1970s. So they were seen as championing "modernity" perhaps, as contrasted to the old white superheroes of the 1940s and 1950s. And electricity and cybernetics are "modernity" too. regarding Japan: it may be "Land of the rising sun" type of a stereotype.